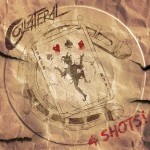 Share the post "EP review: COLLATERAL – 4 Shots"
Collateral are new kids on the rock block and with their guy liner & ripped jeans look you’d think they hailed from the Sunset Strip back in the day, when in fact they are from Kent. Collateral consist of vocalist Angelo Tristan, drummer Ben Atkinson, bassist Jack Bentley-Smith and guitarist Todd Winger. ‘Midnight Queen’, as well as having an entertaining video, is the stand out song recalling Bon Jovi and at times Aerosmith, with a catchy chorus and lyrics that don’t take themselves too seriously. ‘Angels Crying’ mixes acoustic playing with a big, country rock guitar chord – Jon Bon Jovi would trade a pair of his cowboy boots for a song like this I am sure. ‘Just Waiting For You’ allows the band to stretch themselves musically, complete with a suitably tasty solo from Todd Winger, whilst ‘Going With The Wind’ recalls White Lion as the song builds from a gentle intro. This entry was posted in All Posts, Single and EP reviews and tagged 4 Shots, classic rock, Collateral, debut, EP, hard rock, melodic, review. Bookmark the permalink.